Q. When the snow melted, we noticed our lawn is riddled with molehills. What can we do to eradicate them? A. It could be that the moles are trying to tell you something. While moles will eat bulbs and the roots of plants, when they dig burrows under lawns it’s usually to eat the grubs of cutworms and larger beetles. During winter months, these juicy morsels tempt moles to dig where they would not normally do so. Grubs are very damaging; they eat at the root system of your lawn, resulting in dead patches. 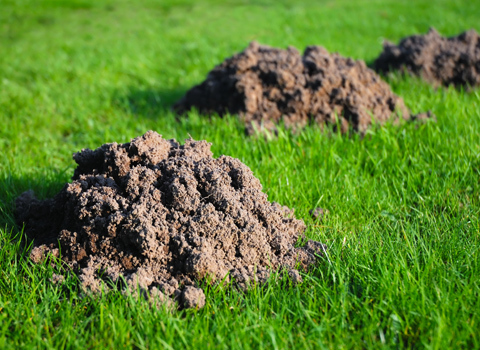 Moles are actually doing you a favour by preying on the grubs and are likely causing less damage than if they left the grubs alone. It’s understandable that you don’t want your lawn torn up. However, if you deter the moles without dealing with the reason they’re there, more moles will simply move in for the food source. • An environmentally friendly method of deterring moles is to plant castor oil plants and drench the soil around mole tunnels and mounds with castor oil. Moles will not cross a castor oil barrier. You can make the castor oil go further and get the same results by diluting it with water. In late fall, spray the border around your lawn with castor oil. A five-centimetre strip should be sufficient. In late summer, check your lawn for brown spots of dead grass, which would indicate that grubs have been feeding on the roots of your grass. If so, double your spraying of castor oil. You can also try placing an empty soda bottle near the entrance to one of their holes—the sound of the wind in the bottle can scare the moles off. Assuming the moles are after grubs, you’ll also need to deal with your grub problem. Send your wildlife questions to CWF’s conservation researchers, Terri-Lee and Leigh! Your questions and answers could be featured in a future issue of Wildlife Update!